This is a new briefing from the Civil Society Working Group on Gene Drives which includes Biofuelwatch, Econexus, ETC Group, Friends of the Earth US, Hawai’i SEED and Navdanya. It can be downloaded as a pdf here (en español). Gene drives can entirely re-engineer ecosystems, create fast spreading extinctions, and intervene in living systems at a scale far beyond anything ever imagined. When gene drives are engineered into a fast-reproducing species they could alter their populations within short timeframes, from months to a few years, and rapidly cause extinction. This radical new technology, also called a “mutagenic chain reaction,”  is unlike anything seen before. It combines the extreme genetic engineering of synthetic biolog y and new gene editing techniques with the idea that humans can and should use such powerful unlimited tools to control nature. Gene drives will change the fundamental relationship between humanity and the natural world forever. The implications for the environment, food security, peace, and even social stability are significant. Dealing with this run-away technology is already being compared to the challenge of governing nuclear power. Existing government regulations for the use of genetic engineering in agriculture have allowed widespread genetic contamination of the food supply and the environment. The ethical, cultural and societal implications of gene drives are as enormous as the ecological consequences. Civil society groups (and even some gene drive researchers) are alarmed by this newfound ability to reshape the natural world. However, such an omnipotent power to control nature is immensely tempting to those who may not be constrained by either common decency or common sense. Gene drive technology is commanding the attention of the world’s most powerful military, agribusiness, and social change organizations. Gene drive technology also appears to be relatively simple and cheap, so it could easily fall into the hands of those, including governments, who might use it as a weapon. A trait is a genetically determined characteristic of an organism (e.g. eye color). In normal sexual reproduction, a trait generally has only a 50% chance of being expressed. With a gene drive, however, that trait is “driven” into the organism’s reproductive cycle so that every single offspring always carries and expresses the specified trait. Gene drives force an artificially engineered trait to spread through the natural population until it becomes ubiquitous or crashes that population. The first working gene drives were demonstrated at the end of 2014 using a new gene-editing technique known as CRISPR-CAS9. They work by setting up a genetic enforcement mechanism which copies itself from parent to child, cascading from one generation to the next by sexual reproduction. Gene drives only work in sexually reproducing species. The natural process of inheritance through sexual reproduction is the cornerstone of biological diversity within a species. But gene drives force a species towards uniformity or extinction—a perfectly anti-ecological outcome and a violation of the fundamentals of evolution. For example, when a gene drive commands an organism to glow green, the “mutagenic chain reaction” that follows ensures that all future progeny of that organism, and all its descendants, also glow green. This violates the normal rules of species evolution, which usually limits the passing on of a new trait to only some offspring and limits its survival to those that have a selective advantage. The implications for natural populations are striking. Figure 1a. shows the normal pattern of inheritance across the generations. Following the established rules of genetics, we can expect roughly 50% of an organism’s offspring to carry a specific gene. Once that altered organism is introduced into a population, the number of affected organisms can dilute through the generations. 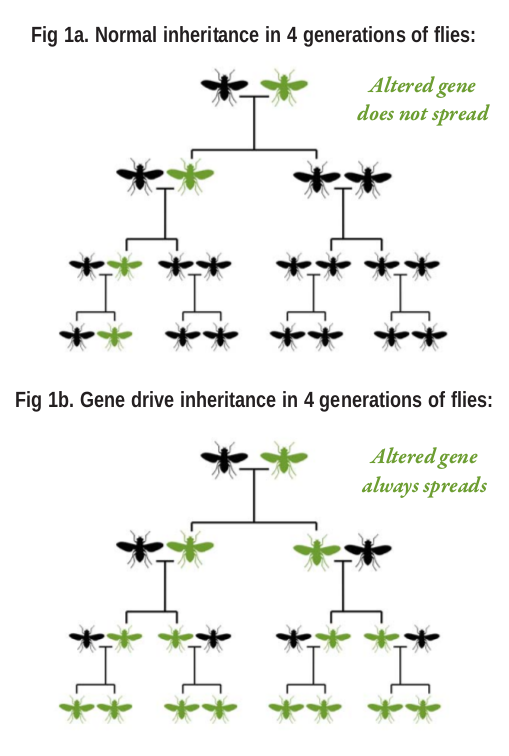 But with a gene drive (see Figure 1b.) there is 100% inheritance of the new trait enforced among all descendants. Instead of being diluted, the new trait takes over. If someone wanted to ‘crash’ a species and cause its extinction, they would simply engineer a gene drive that makes all the offspring into males, for instance. This approach is being taken with the so-called ‘daughterless’ mouse gene drive. Any mouse that the daughterless mouse mates with will only give birth to males. In turn, all their progeny will only produce males and they will spread the ‘daughterless’ trait until they overwhelm that mouse species and crash the population. Theoretically, this “male-only” mechanism could be used with any sexually reproducing organism. Global drives: a “standard” gene drive that continues to spread, potentially until it takes over the entire species (or causes the entire species to go extinct). Split drive: a technique where half a gene drive is engineered into an organism’s DNA, and half into a piece of associated virus DNA, so that the organism won’t pass on the full instructions for a new gene drive. This is intended for lab safety but is impractical as a technology in the wild. Daisy drive: a proposed gene drive that theoretically stops working after a certain number of generations. This is supposed to create ‘local’ gene drives that won’t spread uncontrollably. The inventor, Kevin Esvelt, acknowledges that a daisy drive could mutate into a global drive accidentally. 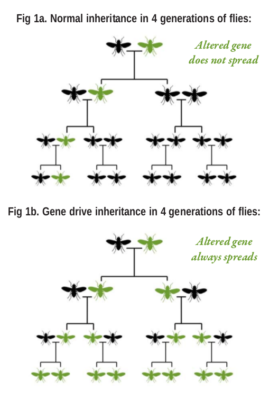 How can gene drives be used? Gene drive developers acknowledge that agribusiness is interested in this technology for many uses. These include eradicating weeds (a “sensitizing gene drive” could be released into wild weed species to make it more susceptible to a proprietary herbicide such as roundup), or eliminating pests. For example, gene drive research on fruit flies—specifically on species like Drosophila Suzukii, which attack soft fruit harvests—is intended to eradicate it globally and save on the costs of both pesticides and lost crop damages. Other pests that might be driven to extinction to protect industrial agriculture include mice, moths and locusts. Gene drives may also be used to speed up the introduction of a genetically modified trait into seed harvests. Mosquitos: Several teams are working on gene drives that would eradicate mosquitos or re-engineer them so they are unable to carry malaria. Theoretically the mosquitos that carry Zika and Dengue could also be attacked with gene drive systems. A small group of conservationists argue that tools that cause deliberate extinction could be harnessed for good. A consortium of 5 partners (including two government agencies) led by the conservation group Island Conservation is developing gene drive-equipped mice that will be released on islands ostensibly to kill the mice that harm birds. What are the environmental dangers of gene drives? Gene drives carry the same biosafety risks that other genetically engineered organisms carry and more. We know the track record of genetically modified organisms (GMOs) acting in unexpected ways and causing a variety of environmental harms, while not delivering on their promised benefits. Gene drives are designed not only to spread rapidly but also to do it with exponential efficiency. There is nothing in the natural world to compare them to and that limits our capacity to predict their behavior. Gene drives are designed to create large-scale changes in populations and intentionally impact entire ecosystems. We know so little about the web of life as it is, are we really ready to take such radical steps to alter the course of evolution? It’s impossible to predict the ecological consequences of such a rapid, massive, unprecedented disruption. Removing a pest may seem attractive, but even pests have their place in the food chain. Additionally, eradicating one species might unpredictably open up space for the expansion of another species which may carry diseases, affect pollination or otherwise threaten biodiversity. Could gene drives jump species? Promoters of gene drives present them as precise mechanisms, just as GMO promoters did. But living systems and sexual reproduction processes are messy and unpredictable. We now know there is occasional horizontal gene transfer (movement of genes between different species) and that some genes do cross over into related species. The ethical, cultural and societal implications of gene drives are especially complex and challenging. Civil society groups, and even some gene drive researchers, are raising the alarm about the power of this technology. Such a powerful tool may be too tempting to military funding agencies and hi-tech agribusiness who see advantages to exploring this Pandora’s box. This raises the basic question: who will this technology benefit and who decides how it will be used? The potential threat of weaponized gene drives can’t be overstated. While a harmful gene drive could theoretically be engineered into a fast-spreading parasite to ‘wipe out’ a population or used to crash a food harvest, the bigger threat may come from the changing geopolitics and security requirements that the existence of gene drives may unleash. The need to police gene drives as a potential bioweapon may expand and deepen military control and collusion in biotechnology developments. Proposals to unleash gene drives as a ‘silver bullet’ for health and conservation challenges are highly risky and speculative. But these “technofixes” continue to be over-sold to the public through deceptive media campaigns, corruption of regulatory agencies, and by inflaming the public’s fears and anxieties about disease, climate change, and species extinction. “Silver bullet” technologies distract from, rather than contribute to, the work that needs to be done to root out the systemic causes of these problems – such as providing sanitation, defending human rights, addressing poverty and upholding community land rights and stewardship over nature. The Civil Society Working Group on Gene Drives prepared this briefing. We believe that no case can be made for proceeding with gene drive experiments or developments at this time. Moreover, in our view, recent proposals to move ahead with real world gene drive trials (e.g. the GBIRd project led by Island Conservation and the gene drive mosquito in Hawaii) are reckless and irresponsible and do not reflect the essential values of the conservation movement. Such projects should not be funded or promoted by non-profit groups or philanthropic organizations whose social contract and tax-exempt status is founded on the principle that they are doing a public service. • An immediate and international halt to gene drive releases and experimentation. • All existing patents on this technology should be either extinguished as against the public interest or handed to an international agency charged with preventing licensing or use of the technology. • Scientists, ethicists, environmental groups, civil society groups, lawyers and even artists and poets must speak out clearly against gene drives in a concerted and public way, calling for the withdrawal of support for the funding and continued promotion of gene drive technology. Gantz VM, Bier E. The mutagenic chain reaction: a method for converting heterozygous to homozygous mutations.Science(New York, NY). 2015;348(6233):442-444. doi:10.1126/science.aaa5945. National Academies of Sciences, E ngineering, and Medicine. Gene Drives on the Horizon: Advancing Science, Navigating Uncertainty, and Aligning Research with Public Values. Washington, DC: The National Academies Press, 2016. doi:10.17226/23405. Science. 2014 Aug 29;345(6200):1010. doi: 10.1126/science.345.6200.1010-b. 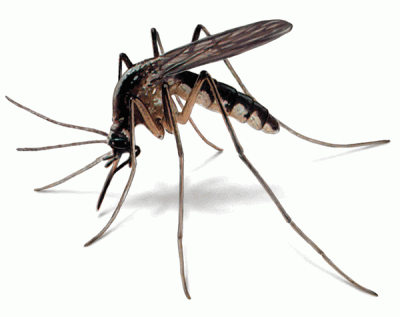 Gene Drives raise dual-use concerns. GBIRd project (Genetic Biocontrol of Invasive Rodents) led by Island Conservation International – details at http://www.islandconservation.org/program-coordinator/. Samuel, M. D., B. L. Woodworth, C. T. Atkinson, P. J. Hart, and D. A. LaPointe. 2015. Avian malaria in Hawaiian forest birds: infection and population impacts across species and elevations. Ecosphere 6(6):104. http://dx.doi.org/10.1890/ES14-00393. The Civil Society Working Group on Gene Drives includes Biofuelwatch, Econexus, ETC Group, Friends of the Earth US, Hawai’i SEED, Navdanya and independent author and lawyer Claire Hope Cummings, M.A., J.D.